Burnley are yet to receive any bids for defensive kingpin Michael Keane. But they are steeling themselves for eight-figure offers, with long-time admirers Everton and Premier League champions Leicester City believe to be interested in the 23-year-old. 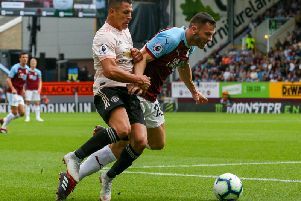 Both clubs are reported to be preparing bids in excess of £10m for the former Manchester United youngster, who was a virtual ever-present last season as the Clarets won promotion back to the top flight at the first attempt, starting all bar two league games, scoring five goals – including critical efforts against Brighton and Middlesbrough. Stoke City were linked with a £7m switch in the January transfer window, with a reported offer failing to materialise, and Keane has also attracted attention from the likes of Bournemouth and Swansea City, as well as Norwich City and Aston Villa before their relegation to the Championship. Before the start of the season, Keane was rated by former United colleague Rio Ferdinand as one of “the best 3 young 21s CB’s in England right now” with John Stones and Eric Dier, adding “all future full England internationals 100%”. And he very much hopes to fulfil that potential to make the step up from the Under 21s, for who he made 16 appearances between 2013-15, as he said after clinching the Championship title with Burnley: “For me, at the moment, it is about trying to do well for Burnley in the Premier League. Leicester are thought to want Keane – who played 22 games on loan with the Foxes in 2012-13 – as cover for Wes Morgan and Robert Huth, but the title-winning partnership would be difficult to break up, with the player joining Burnley from United two years ago for first team football. He has often spoken about being happy at Turf Moor, saying about speculation about his future in January: “It’s not distracting. “Obviously I see it but I don’t know whether to believe it or not. It’s just one of those things. “If it’s true then it can be very flattering, but I’m really happy here at Burnley. “Everyone in the team, the manager and the fans have been great with me, so there’s no reason for me to leave. “You just take it as a compliment. “It just proves that you’re playing well if there’s teams coming after you. “I think I’m defending well consistently now. “I think I’ve been doing well on a personal level for a while now, so I’m just hoping to keep it up. It’s just speculation – you don’t know whether to believe it or not – but it is nice to see. “I think I’ve developed a lot here under the gaffer. “I’ve had all the experienced players helping me as well.